If coordinated effectively, the move might save the lives of tens of thousands of civilians and create a new environment for a diplomatic solution. What Clinton was advocating was a U.S.-led military intervention to stop Russian and Syrian warplanes bombing civilians in rebel-held areas like Aleppo, even if it meant clashing with Russia. That’s what a no-fly zone means. As secretary of state when the Syrian war began, Clinton knows all this perfectly well. She’s aware of all the implications. Perhaps she was taking such a position to create distance between herself and her Republic opponent Donald Trump, who’s in favor of the Assad regime remaining and takes the Kremlin’s line that in Syria “Russia is killing ISIS” rather than pulverizing civilians who just happen to live in rebel-held areas. Also, she may also believe that a tough stance will help her on November 8. But that’s unlikely, as she knows full well that the polls show that Americans have no appetite for another war in the Middle East, particularly young voters on the left – Bernie Sanders supporters whom she has not yet fully won over. It’s much more likely that Clinton simply believes what she said on Sunday. Does that mean that if Clinton wins next month, as the polls overwhelmingly predict, and becomes president in January, the United States will soon be at war with Russia in the skies over Syria? Is a no-fly zone even feasible? Can it help the people of Syria? Would Russia back down? 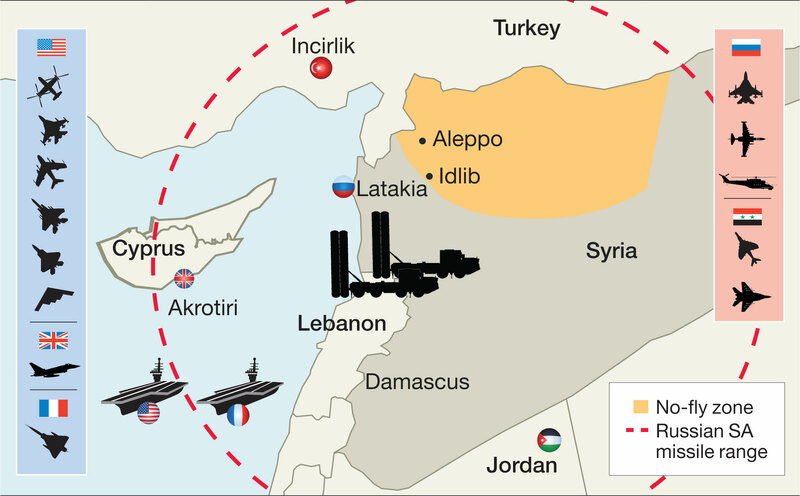 Would a clash in Syria mean an escalation in other regions between two nuclear powers? It’s impossible to foretell how a complex military operation would unfold in what is already a chaotic situation. And by the time Clinton would settle down in the Oval Office, the war would be nearly six years old. But unlike the wars that Washington has embarked on in the Middle East, no-fly zones have clear objectives and limits. They have been enforced three times – in Iraq, Bosnia and Libya – with various degrees of success. Syria is in many ways a much more difficult situation, mainly because a large and well-equipped air force is already operating there with impunity. But that’s arguably why a no-fly zone is so urgently needed. The first consideration is timing. The next president will be sworn in on January 20. Assuming it’s Clinton, she will already have an experienced national security team ready to take over and a clear idea of her foreign policy. Theoretically, she could choose to move very quickly. At the current rate of Russian bombing, little may remain by then of eastern Aleppo, and the quarter of a million people still there will have been killed or will have fled. But whether or not Aleppo is still standing, and its defenders have repeatedly defied expectations by holding out so long, other rebel-held areas will be under attack. Aleppo’s dire situation may even bring forward a no-fly-zone operation. Barack Obama, who currently opposes a no-fly zone, will remain commander of chief until the swearing-in, but the situation on the ground, Russia’s obduracy and the stated policy of the next president could make him change his mind. On the other hand, if he’s still adamantly opposed, he and Secretary of State John Kerry will be all the more keen to reach a cease-fire, however shaky and to the Assad regime’s advantage it might be – a cease-fire that Clinton will be loath to jeopardize. But whichever president makes the final call, the goal will be to ensure international backing first. In Syria, there is no prospect of a Security Council resolution, as Russia, which has already vetoed five resolutions condemning the Assad regime, would undoubtedly veto a no-fly zone. There would also be legal issues, as the Assad regime is still the internationally recognized government and Russia’s forces are there at Assad’s invitation. To justify acting without UN backing, the administration would say that the Assad regime has lost any claim to be Syria’s legitimate government due to its war crimes and because it has lost control of most of Syria’s territory and the support of most of its people. To bolster those claims, it would seek the support of key allies to take part in a coalition enforcing the no-fly zone. The obvious candidates are the over 30 nations currently supporting Operation Inherent Resolve led by the United States already fighting the Islamic State in Syria and Iraq. Of these nations, the key Western allies are Britain and France. Both already have advanced fighter planes – Eurofighter Typhoons and Rafales – deployed in the region that can take part in the combat air-patrols enforcing the no-fly zone. They also have a range of intelligence-collecting, electronic-warfare, tanker and command-and-control aircraft for the mission. Britain and France also add major strategic assets to an air operation over northwestern Syria – the Royal Air Force base Akrotiri in Cyprus is within half an hour’s fast-jet flight time from Aleppo. The French aircraft carrier Charles de Gaulle, which is already conducting anti-Islamic State operations in the eastern Mediterranean, is the only non-American carrier capable of operating U.S. Navy F-18s. France is currently much more forceful than the United States on confronting Russia over Syria and would almost certainly join a no-fly-zone task force. So would Britain. Prime Minister Theresa May could follow her predecessors in seeking parliamentary approval, and while Labour leader Jeremy Corbyn would certainly oppose any intervention, there are enough rebel Labour MPs who would support it and ensure a majority. The third key ally would be Turkey, which has repeatedly demanded a no-fly zone. Turkey has a large and well-equipped air force, including over 200 advanced F-16 fighters and support aircraft, and more importantly, it borders Syria to the north. So it would provide nearby air bases including Incirlik, which is already used by the United States and other countries for anti-Islamic State operations. Sill, it’s unclear whether Turkey still holds to its pro-no-fly-zone positions. Following the failed coup in July, U.S.-Turkish relations have suffered a downturn as Ankara demands that Washington extradite Islamic cleric Fethullah Gulen, who it accuses of orchestrating the coup. Meanwhile, Turkey has drawn closer to Russia, with two recent meetings between presidents Recep Tayyip Erdogan and Vladimir Putin. The administration would also seek to include Arab members in a no-fly-zone coalition, mainly to bolster legitimacy. These would probably include Egypt, Jordan, Saudi Arabia and other Gulf nations, even though their contribution would largely be symbolic. Jordan has a small air force but could provide bases near the Syrian border. Egypt and Saudi Arabia are preoccupied with their own wars in Sinai and Yemen. Saudi involvement would open Washington to claims of hypocrisy because the Saudi airstrikes in Yemen, though their scale is not comparable to those by Russia and Assad, have caused hundreds of civilian casualties. Once a decision has been made and while a coalition is being formed, the forces for enforcing a no-fly zone – an aircraft carrier group (either the Dwight Eisenhower currently in the Persian Gulf or the George Washington now in the Caribbean) – and U.S. Air Force squadrons could be deployed to the eastern Mediterranean. A former chairman of the U.S. Joint Chiefs of Staff, Gen. Martin Dempsey, warned in 2013 that a no-fly zone would need 70,000 personnel. This figure may have been exaggerated to bolster the Obama administration’s opposition to such a move and since then, many of the elements necessary have already been deployed to the region to fight the Islamic State. America’s armed forces are equipped and trained to carry out these long-range deployments and could be ready to enforce a no-fly zone within weeks. The next step would be to announce the zone’s borders, most likely at first over the northwestern Syrian regions of Aleppo and Idlib. Combat air patrols would begin in order to ensure that Russian and regime aircraft do not enter. Could Russia oppose this? The Assad regime’s air force is in no condition to defy the USAF and other Western air forces with its handful of inferior MiG-21s and MiG-29s. Russia’s contingent is better-equipped of course but consists of only around 40 fixed-wing combat aircraft (and about 20 helicopters) all based at Khmeimim Air Base near Latakia. Most of these are ground-attack planes like the Sukhoi Su-25, poorly equipped to survive air-to-air encounters. According to most assessments, Russia has only about 10 dedicated air-superiority fighters in Syria – a mixture of Sukhoi Su-30 and Su-35s. These are Russia’s best fighters, comparable to Western F-15s, Typhoons and Rafales. But they would be outnumbered and without the massive array of support aircraft the American-led coalition would have. They thus would have little chance of resisting for more than a few hours. They would also be limited by the fact that their one base in the region – Khmeimin (the other Syrian air bases are too dilapidated to sustain advanced operations) – has a sole runway that can be disabled by an American airstrike. Russia could of course try to reinforce its contingent in Syria but the potential for doing so is limited. The number of advanced Su-30 and Su-35s in service is still under 200 and most are needed for the air defense of Russia, which lacks the logistics to sustain large-scale operations far from its borders. The route its military aircraft must take to Syria is a circuitous one over Iran and Iraq and can easily be cut off by the Americans. To strengthen its air-defense prowess, Russia has shipped to Syria two batteries of advanced S-300VM and S-400 missiles. These are extremely capable systems that can track dozens of targets up to 400 kilometers (249 miles) away but are vulnerable in that they can’t be easily dispersed and hidden. The United States has at its disposal stealth fighters and bombers – the F-22 and the B-2 – electronic-warfare EF-18Gs, large numbers of Predator and Reaper drones and special-forces teams all trained and equipped to swiftly locate, suppress and destroy missile batteries. A confrontation between a U.S.-led coalition and the Russia-Assad alliance would almost certainly be a one-sided affair with America and its allies losing at worst a handful of aircraft. Russia’s military planners are fully aware of this, which leads to two main questions: Would Russia back down in Syria or risk a military humiliation? And would it choose instead an escalation on other fronts closer to its borders where it’s at less of a disadvantage? While these eventualities must be taken into account, they don’t necessarily have to happen if rules of engagement are established and followed. The Russians and the Assad regime could simply decide not to send aircraft into the no-fly zone and avoid being shot down. And their anti-aircraft batteries could refrain from locking on to the coalition’s aircraft and avoid being attacked. Either way, if Russia responds in Syria or backs down, it will be humiliated. This may be the “leverage” Clinton spoke of that will force Moscow to agree to a cease-fire including an enforceable commitment to cease bombing civilian areas. But Russia could respond in an operation against Ukraine or in an ever bigger provocation against the West, against NATO members in the Baltic, or intensify its cyberattacks on the United State beyond its current hacking of the presidential election. Is diplomacy still possible to let Russia climb down before it obliterates Aleppo? If so, Kerry’s unceasing efforts have failed to find a way. One of the main arguments against imposing a no-fly zone is that it could dangerously escalate into a confrontation between nuclear powers. The counterargument is that the West can’t let Russia leverage its nuclear capability and act with impunity anywhere, and that if diplomacy and sanctions have failed, the West must be prepared at some point to use its much stronger military. But where is that point? If the West failed to prevent Russia from attacking Georgia in 2008, from attacking Ukraine and occupying Crimea in 2014, and now won’t attack when Russia is killing thousands in Syria, where is that point? Russia, with its rapidly shrinking economy, is hardly in a position to open an all-out war with the United States simply to keep Assad in power. And if Putin actually is capable of doing so, all the more reason for blocking him sooner rather than later. But if successful in the air, what effect would a no-fly zone have on the ground? The casualty figures in Syria are hotly contested. According to the Syrian Observatory for Human Rights, 3,915 civilians were killed in the first 12 months of Russia’s involvement in Syria. This is “only” 1 percent of around 400,000 killed, including fighters and civilians in five and a half years of war in Syria. But it doesn’t include those killed in the last few weeks in the bombing of Aleppo, and it includes only confirmed victims. So the actual number is likely to be much higher, especially when including people wounded and later dying due to a lack of medical care caused by Russia’s targeted bombing of medical centers. And there are the casualties caused throughout the war by Assad’s airstrikes, a number almost certainly in the tens of thousands. A no-fly zone would save the lives of tens of thousands more civilians who would be killed if the bombardments continued, but it wouldn’t end the fighting and bloodshed. To do so, the no-fly zone must indeed be used to create the leverage that would allow a more enforceable and stable cease-fire than the previous failed ones. Critics of a no-fly zone claim that it would create a vacuum on the ground that would let the Islamic State and other jihadi groups take control of Syria. This is an empty claim as ISIS is now on the back foot; many of its forces have been killed or retreated to strongholds around Raqqa and Mosul. A no-fly zone doesn’t have to mean diverting forces attacking the Islamic State as part of Operation Inherent Resolve. Neither is it a cover for “regime change” in Damascus. It’s true that before Russian warplanes arrived in Syria in September 2015, the Assad regime was on the brink of collapse. But while Russia’s operation hasn’t succeeded by any means in ending resistance to the regime, it has significantly weakened the rebel groups that have largely been on the defensive ever since. In the near future, and end to airstrikes on rebel-held areas won’t be enough to let the rebels threaten the regime, which in the last year has been reinforced by tens of thousands of Iranian-led Shi’ite-militia fighters. If Clinton is indeed serious about what she says and the United States and its allies imposed a no-fly zone effectively, the move might save the lives of tens of thousands of Syrian civilians and create a new environment for reaching a diplomatic solution. It could also be the move that finally checked Putin’s aggression in the region and elsewhere. As in the past, Washington won’t be asking its closest ally in the Middle East to join a military coalition there. For all the changes in the region, Israel as an official member of a group of nations operating in an Arab country is still unthinkable. Israel would undoubtedly provide intelligence and other quiet technological cooperation, but overt collaboration would be too much for any “moderate” Arab countries in the coalition, even if they cooperate with Israel on other matters. Israel would also be wary of any open alliance with the coalition due to its successful coordination over the last year with Russia. Despite initial fears that the Russian presence would limit Israel’s own operations against Hezbollah, a series of meetings between Benjamin Netanyahu and Putin laid the foundations for an orderly “deconfliction” process between the countries’ militaries. While the United States will remain Israel’s most important strategic ally, this is one conflict that Israel will resolutely keep out of. For once, this is something all sides will be happy to agree on.